That risk communication ranks high on the policymaking agenda is beyond discussion today. The field is a point of intersection of social communication, practical management and policy making. It covers such diverse activities as to inform and educate the public about risk, and risk management in order to influence attitudes and behaviour, to act in situations of emergency or crises, to aid in decision-making and to assist in conflict resolution. Communication has grown into a major concern in current risk governance based on network co-ordinated management of public affairs conducted by authorities and companies and is recognized as a key component in the government of risk. This is especially salient in policy fields relating to environmental planning and resource management, urban planning, chemical and food regulation, or infrastructure planning, development and maintenance. 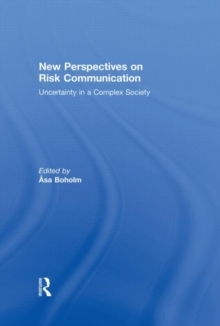 This book explores risk communication research with a focus on new theoretical perspectives, research findings, and applied goals. It reflects on a broad range of innovative theoretical perspectives, methodological approaches and empirical areas. This book was published as a special issue of the Journal of Risk Research.